Vaughn Lee Andrews-McKay (CRD #6491985, Shelton, Connecticut), who was a registered representative of Pruco Securities, LLC between August 25, 2015 and May 1, 2018, consented to being barred by the Financial Industry Regulatory Authority (“FINRA”) from acting as a broker or associating with FINRA member broker-dealer firms pursuant to Andrews-McKay’s a Letter of Acceptance, Waiver and Consent (“AWC”) #2016051931501 executed on May 8, 2018. Andrews-McKay was found liable for converting a customer’s funds. The AWC stated that Andrews-McKay had converted $29,648.19 belonging to Pruco customers PM and RK in January 2017. The findings indicated that Andrews-McKay deliberately intended to deceive PM and RK, convincing them to write him checks so that he could use the money to address financial obligations of the customers. The checks had apparently been deposited by Andrews-McKay into a bank account which he had control over, and he then used PM’s and RK’s money for his personal use. FINRA Department of Enforcement also found that from July to October 2017, Andrews-McKay converted $18,100.00 more from PM. This time, Andrews-McKay apparently wrote checks out to himself from the checking account that PM owned; PM had neither known nor consented to Andrews-McKay’s activities. The findings stated that Andrews-McKay forged the signature of PM on checks written out to himself. Like before, Andrews-McKay evidently deposited the checks into a bank account which he had control over, and proceeded to use PM’s and RK’s money for himself. FINRA Department of Enforcement noted in the AWC that FINRA Rule 2150(a) proscribes registered representatives or any FINRA member from using funds or securities of a customer in an improper fashion. Additionally, FINRA stated that converting a customer’s funds not only violates FINRA Rule 2150(a), but also FINRA Rule 2010 – which requires members of FINRA to observe strict standards pertaining to the equitable principles of trade. FINRA Department of Enforcement found that Andrews-McKay committed violations of both FINRA Rules 2150(a) and 2010. Prior to FINRA barring Andrews-McKay in all capacities, Pruco terminated Andrews-McKay’s employment, contending that Andrews-McKay, inter alia: misappropriated customers’ funds; forged a customer’s signature on checks that Andrews-McKay acquired from the customer; and engaged in an outside business activity without providing Pruco with notification. 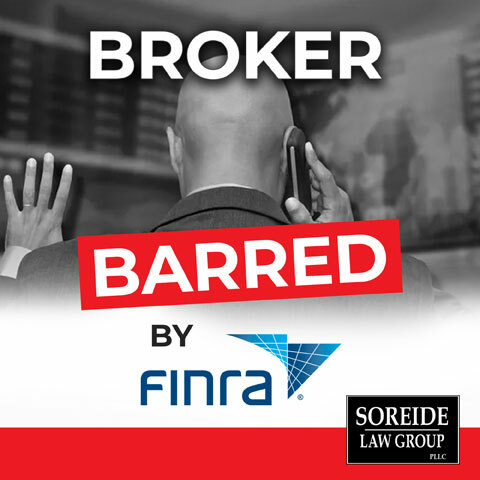 In addition, Andrews-McKay has disclosed on FINRA BrokerCheck that on May 30, 2018, a Pruco customer alleged that person placed the customer’s assets in an annuity that was not appropriate for the customer given the customer’s financial situation. The customer also alleged that person mishandled the customer’s account, stealing the customer’s money. A total of $45,000.00 has been requested by the customer as a result. If you have suffered losses due to the misconduct of a broker or brokerage firm, call (888) 760-6552 for a free consultation with Soreide Law Group’s experienced counsel. Our firm has recovered millions of dollars for investors who have been victim to conversion or unsuitable sales practices. We represent clients on a contingency fee basis and advance all costs.